US Air Force F-5E's saw "Gomer" duty from 1975 until 1990 as noted at Nellis, and also with the 527th Aggressor Squadron at Alconbury RAF in the UK and the 26th Aggressor Squadron at Clark Air Base in the Philippines. Upon USAF upgrading its Aggressor units to F-16's in 1989, some of the USAF F-5E's found their way to the US Marine Corps to replace their F-21s. The U.S. Navy used the F-5E extensively at the Naval Fighter Weapons School (TOPGUN) and with other active and reserve squadrons providing for Dissimilar Air Combat Training (DACT). Authenticity to Prototype: A+ Overall proportion and appearance of the markings seem to be spot-on against a host of web- and paper-based reference photos. 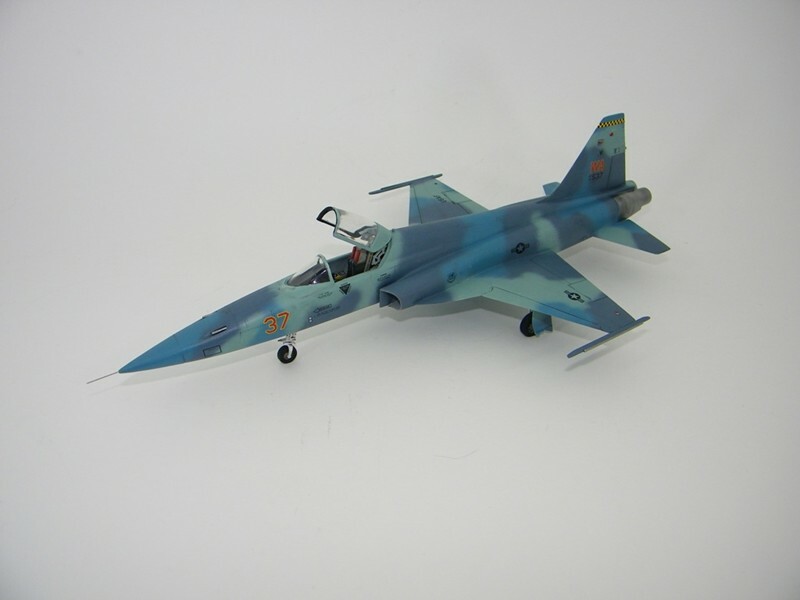 Instructions: A+ Full-color four-view profiles are provided for each of the five subject aircraft, along with an extensive reference of prescribed Federal Standard color numbers and available paints. Overall Grade: A+ Expectations for Twobob's products are always very high, and this latest sample did not disappoint. These markings are outstanding! Sample decals were applied to a refurbished Esci F-5E originally built 27 years ago, recently stripped and refinished for this review. An old favorite, with Dullcote long since yellowed, again shines like new and has a place of honor and distinction in my collection. It goes without saying...or at least it should...that these decals get my highest recommendation for any modeler wishing to build an accurate Blue or Ghost scheme Nellis Gomer F-5E. The markings are so good and the schemes so colorful, why stop at one...why not build all five? Very tempting! Thanks to Twobobs for the sample and the opportunity to build an eye-popping Nellis Gomer!